The Infernal Internal. Navel-gazing. Thought-based narrative. 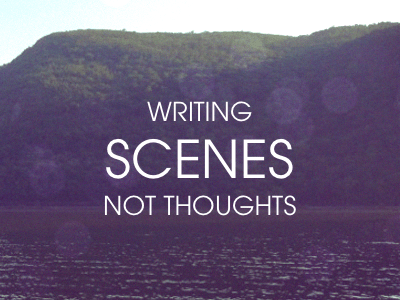 When you are writing a scene, do you ever make the mistake of getting too caught up in your protagonist’s thoughts and observations, rather than their actions and interactions? If so, you may be losing your reader. If you find yourself relying on verbs like “think”, “know”, “feel”, “see”, “hear”, “remember”, “believe”, “realise”, “want”, “love”, “hate”, then I’m talking to you! “I knew I was hungry.” This is a thought. It is comparatively abstract and remote. “I was hungry.” This is a fact, not a thought. It is comparatively active and emotive. “My stomach growled.” Of course, an even more evocative sentence would also show, not tell. “She realised John would never leave.” This is a thought. “John would never leave.” This is a fact, not a thought. “John folded his arms and said, ‘I’m staying put. '” Showing not telling. “He knew his chances of outrunning the wolf were close to nil.” Thought. “His chances of outrunning the wolf were close to nil.” Fact. “The wolf raced after him, gaining on him every second.” Showing not telling. In all of these examples, the first version is the thought, the observation. It places us in the character’s head, whereas the second version places us in the scene, a whole lot closer to the hunger, to John’s presence, to the threat of the wolf. They are stated as facts, so we believe them far more than we can ever believe a thought or a feeling. The third version demonstrates how to translate this fully from the abstract to the concrete. This will feel much more immediate and are more strongly emotive, visual and striking. It’s not that the thought-based versions are wrong, per se. But generally, thoughts are abstract and intangible. Actions and facts are concrete, and if you make them rich enough, then they will give your readers all the space they need to do the thinking, the knowing, the loving and the hating. Often, writers add their character thoughts/observations at the start of a paragraph. They do this to create the premise for that paragraph and use it to explain the subsequent actions and reactions. The problem is that we’re already disengaged as a result. The solution is to try showing, not telling that statement. If you must keep it, then consider moving it to the end of the paragraph if you feel it’s still vital to support the meaning, but experiment with replacing it first, and you may well find that you didn’t need it after all. Trust me: 99 times out of 100 you’ll end up with a more powerful and evocative scene.